> gives further credence to this. I admit I'm uncomfortable with your use of "tower/stepped" as an equivalency. I consider them to be very different considerations from a structural engineering perspective. And as such, G3 is not a "tower" structure, it's a stepped structure in the general geometry of a pyramid and does not comprise a true vertical core tower, at least according to what's revealed in the gash. Zone 1. The courses below the red line are part of the outer external face of the pyramid. Zone 2. The courses between the green and red line comprise the upper (presumably) part of a step that's recessed back from the red line (note the couple of loose rounded boulders sitting on top of the course marked with the red line). The green line is at the top of the step. The 2 or 3 courses shown in this Zone form a flat vertical wall (albeit short since it's comprised of only a few courses visible in this photo). Zone 3. The courses between the blue and green lines are a middle step that's set farther back from Zone 2 and includes about 10 courses that form a flat vertical wall. Zone 4. The courses above the blue line are set back from Zone 3. At first they appear to be another step that's set back from the Zone 3 step, but in fact, these blocks do not seem to be set back as far as Zone 3 is set back from Zone 2; also note that these blocks are more roughshod than the quality of workmanship in Zones 2 and 3. Therefore, I believe these blocks are not part of that internal step structure but, rather, appear to be part of the outer "skin" that forms the flat inclined outer face of the pyramid. Note how those blocks merge with the outer face plane comprised of similarly roughshod blocks (compared to the inner step blocks). 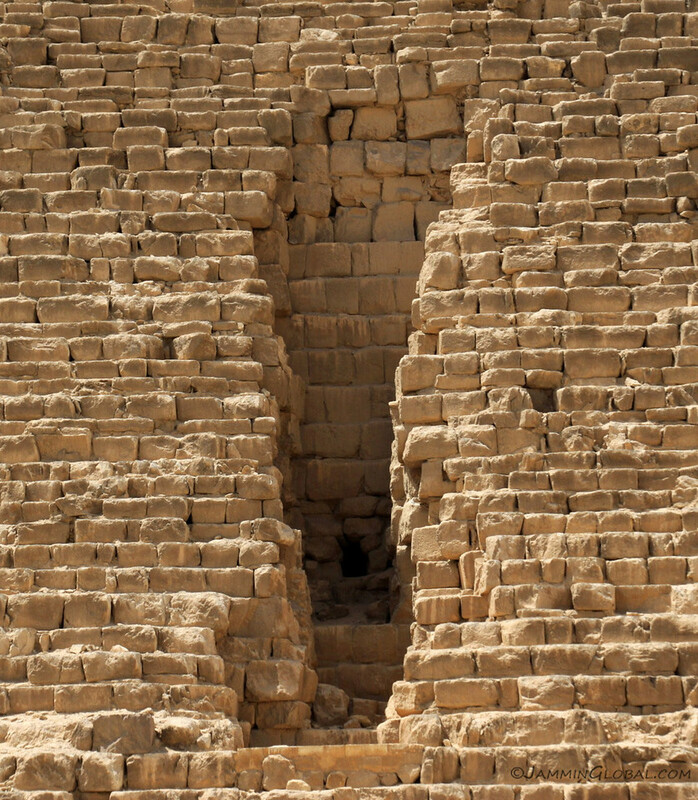 To summarize, I believe the gash shows 2 internal steps (Zone 2 and Zone 3) with Zone 1 and Zone 4 being the blocks that comprise the "skin" that was added on top of the step structure to transform the outer stepped wall into a single inclined face on each side of that pyramid. If those 10 courses in Zone 3 represent the average height of other steps in that pyramid, then only the top 2 or 3 blocks are exposed in the step below that. And in any case, I don't see evidence of a central "core tower" as much as a simple step pyramid with an outer skin that turned it into a true flat-faced pyramid. [Edit: Note that the purple circle indicates what appears to be a small circular opening that was bored into the bottom of the Zone 3 step, presumably with intent to further excavate/explore the internals]. Edited 3 time(s). Last edit at 28-Mar-18 23:15 by Origyptian.